Are you looking for a chiropractor in the Congleton area? 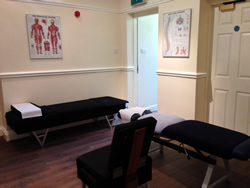 Robert is pleased to welcome you to the chiropractic clinic at West Street in Congleton. The clinic was established in November 2005 and offers the very best in chiropractic care using evidence-based practice. 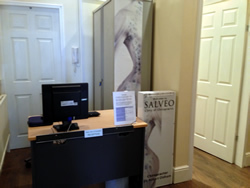 If you are looking for a chiropractor then please ring us now on 01260 277882. Initial examinations are normally £35 and treatments are £40 - both by appointment only. Do you suffer from Back Pain and live in or around the Congleton area? Congleton Chiropractic Clinic is able to help with complaints including Back Pain, Neck Pain, Headaches, Slipped Discs, Work and Sporting Injuries, Whiplash, Carpal Tunnel Syndrome, Frozen Shoulder, Golfer's and Tennis Elbow, Muscle and Joint Pain, and Repetitive Injuries. These are just the most common reasons to see a chiropractor. If your pain or complaint isn't listed, please contact us to see whether we can help you. Robert Oldham is the founder of the Salveo Chiropractic Clinic. Qualified from the Welsh Institute of Chiropractic at the University of Glamorgan, Pontypridd, South Wales with a B.Sc. (Hons) Chiropractic. Robert is passionate about giving the highest quality of Spinal Healthcare. Robert is a member of the Scottish Chiropractic Association and the General Chiropractic Council. At your first consultation with Robert, you will discuss yourself, your health and your motives for coming to a chiropractor. You will discuss the pain or complaint that you are suffering from and also your past history. Some of the questions may seem irrelevant but it is extremely important for Robert to establish an overall picture of your health in order provide the appropriate chiropractic care. It may be that chiropractic is not suitable for you, in which case Robert will refer you to your GP or a relevant specialist. After completing your case history, Robert will examine you. The examination will mainly concentrate on your joints, muscles and nervous system. However, in some cases it will be necessary to check your heart, lungs and abdomen to check for other causes of your problem. This check up is normal procedure in a chiropractic clinic but if it is felt that you would benefit from a more thorough examination, you will be referred to your GP. After the examination you may be offered treatment, although this can be delayed for a few days if Robert needs to take X-rays or obtain further information from your GP. Gowns are made available for you to wear both during the examination and any subsequent treatments. Before your treatment begins, Robert will explain, in simple language, what your problem is and how it can be treated. He will also describe what you should expect after your first adjustment. It may be beneficial for you to change your lifestyle or diet and if this is necessary, Robert will discuss this with you. He will also advise you on exercises that will help your condition improve. 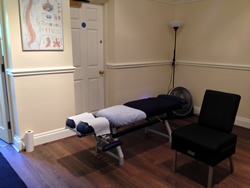 In treating you, as well as using small adjustments - the most common treatment and the one most associated with chiropractic - Robert will also use a wide variety of techniques including ice, heat, ultrasound and exercises. Adjustments, which are performed by hand, are used to free joints in the areas of the body that are not moving properly. Normally, the adjustment requires a short thrust to a joint that can often result in an audible noise. The noise is that of bubbles of gas popping in the fluid of the joint as the pressure is released. After your first treatment, it is possible that you experience temporary symptoms such as pain or soreness around the treated areas. In some cases, your condition may seem worse than to start with. However, treatments do not normally hurt and any discomfort usually passes quickly for most patients. Generally, further treatments are much more pleasant, as your condition gets better. Appointment times for new clients are usually only available between the hours of 10am-5pm, Monday-Friday on your first and second visit as these require a longer booking. If this does not suit please contact us and we will do our very best to find a solution. If claiming through health insurance please check Robert with is registered with your insurer. We are BUPA registered and covered by most major Health Insurance Companies. Please note: There is a £3 admin charge per visit BUPA patients.